Whenever there's a tech boom, there are always companies that just don't learn from others' mistakes, overstretching and eventually falling over themselves in pursuit of greatness. Or, more often, cash. Many companies have learned the hard way that the only way to succeed in technology is to innovate - or you will soon perish. Mind you, for some it wasn't for the want of trying. Silicon Graphics (SGI) made its name in the heady days of high-performance computing when companies would purchase one workstation system for several thousand pounds. Today, with low-cost GPUs from AMD and Nvidia, as well as integrated graphics from Intel, graphics workstations are now comatose - even if Dell and HP still enjoy a booming business selling high-end PCs. Today, it's fitting that new tech giant Google occupies the former SGI campus in Mountain View, CA. 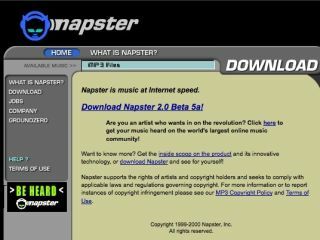 The demise of Napster is well documented: the service started originally by Shawn Fanning became a frequent target of litigation and was eventually shut down for copyright violations. However, this particular tech story has a silver lining. The Napster brand was revived by Best Buy (the company that competed with Circuit City, see below) and is now a thriving commercial entity for legal music streaming. One of the most famous tech implosions occurred at Osborne Computer, the company Adam Osborne founded in 1980. The story goes that Osborne pre-announced a new product that would not be available for a few months, so customers stopped buying the current product. This marketing snafu, called the Osborne Effect, is one reason Apple is so hush-hush about new product timelines. One of the most public disasters from the dotcom era, Webvan.com - a company that delivered groceries you ordered on the internet - had some serious financial backing and plans for fast expansion. Turned out that it was too soon and went bankrupt in 2001. The brand is now owned by Amazon. Although internet groceries are now commonplace in the UK, there simply wasn't enough demand to counteract the vast sums of money the site spent on infrastructure. This US-based electronics retailer simply couldn't fend off the competition - namely, from another super-store in the US called Best Buy (which is also in the process of launching in the UK). One reason the company went belly-up has to do with its sales incentives - even though they dropped commissions eventually, the chain became known for pushy salespeople, not to mention high prices, misleading ads, and poor inventory management. While technically still alive, software company SCO has recently fired their CEO after filing for bankruptcy in 2007 and seems to be near death. The company made its name going after copyright infringements and causing several messy legal entanglements, mostly over Linux trademarks such as UNIX (owned by Novell) and by suing Chrysler over the UNIX codebase (SCO lost). The lesson here: when you start a tech company, it's important to focus on what you do, not what other companies do. Another lesson: Linux is not exactly a cash-cow for litigation. Another dotcom disaster, eToys.com's main problem had to do with keeping enough inventory around -- the "big box" retailers such as Toys R Us always had an advantage in that its stores are essentially a large warehouse with plenty of toys available for purchase. In the late 90s and around 2000, etailers lacked the technical ability to manage inventory, having just the right amount of product to meet the demand. Amazon has now turned this into an elegant ecommerce science. Like the inventory management problem at eToys.com, Amp'd - a mobile phone service for video and other content that was a precursor to the apps you see on smartphones today - had trouble keeping up with demand, especially in terms of customer support and media distribution. And that despite funding from MTV and Universal. The lesson for app company start-ups: make sure your company can scale with demand, likely through a cloud provider for your IT services and alongside companies like ZenDesk that can help you with customer support. Lack of funding led to the 2003 demise of TrueSAN, a cloud storage provider based in San Jose, California. But it wasn't through a lack of initial cash - TrueSAN raised over $30 million in investment. The company became a poster child for the cloud storage market and making sure, if you do store company data in the cloud, that the provider has strong enough financial backing, a healthy infrastructure, and at the very least some guarantees about what happens to your data if they do go belly up.